If you visit a shop selling nature art and photography it is rare not to find one or more pictures of aspens. They grow throughout the northern states and the Rocky Mountains, and are quite distinctive with their straight, vertical white trunks and black spots. This series of images shows aspens in several seasons, with a mountain background. The viewpoint is to be thought of as from a mountain ridge or mesa, with a valley or gorge intervening between the viewer and the far mountains -- a sight one often sees while hiking in the mountains. The autumn image shows a favorite scene of many -- golden aspens at their most colorful. Through the magic of art each leaf is at full color and none have dropped off yet. We have had the luck to take our hike on a clear, crisp sundrenched day. The summer image shows much the same view, with a path wandering invitingly through the open area toward the distant high mountains. 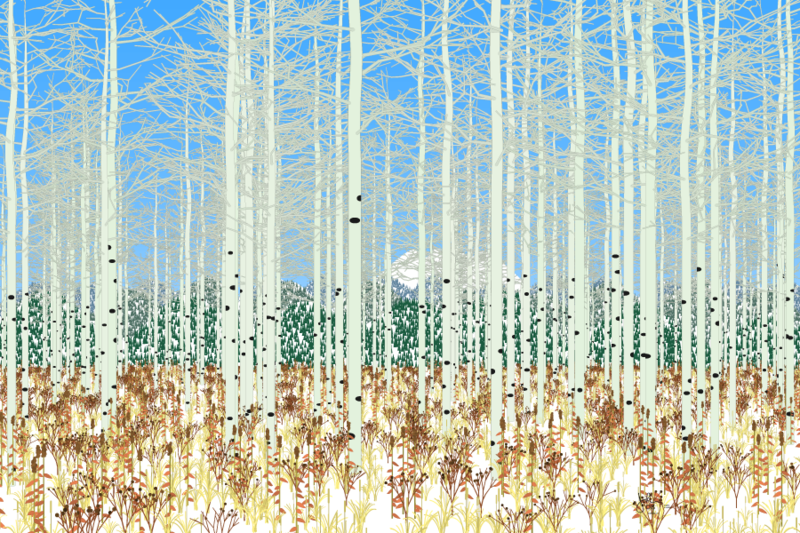 Winter aspens with their stark black-white color scheme are another popular image. Some photographers have managed to capture images where the entire field of view seems to be filled with vertical aspen trunks. Here the trees are spread apart a bit, so we can see the far mountains, and the foreground is dappled with the dead flowers and grass of last summer.